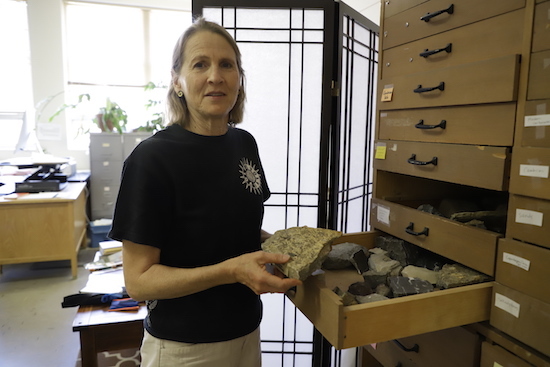 Dr. Maya Elrick, of the UNM Earth and Planetary Sciences Department, has helped lead a team of researchers to discover that widespread ocean anoxia may have triggered the first recorded mass extinction, the Late Ordovician Mass Extinction, some 440 million years ago. “Researchers have known about this mass extinction for over a century and people have been trying to figure out what caused it,” Elrick said. In 2017, funded by an NSF grant spanning three years, Elrick and her team began to tackle the hypothesis that it was caused by a significant decrease in the amount of oxygen in the water which caused many of the marine creatures, who were the only creatures around at this point to die out. To do this, Elrick and her fellow researchers utilized a recently developed uranium isotope technology to test samples they gathered off Anticosti Island near Quebec Canada to, “apply a new tool to an old problem,” Elrick said. Their findings led to a breakthrough about the ancient history of Earth revealing a very probable cause as to what triggered the Late Ordovician Mass Extinction. “The evidence for decreased oxygen happened at the same time the extinction happened. The coincidence in time leads us to believe that is what caused it,” Elrick said. The grant is split between four institutions with UNM being the lead university. As of now, they are continuing their research to the second mass extinction, the Late Devonian Mass Extinction, to generate a curve through time of how much oxygen was in the ocean spanning about 100 million years of time. “As temperatures are rising and humans are overpopulating the planet we are making the oceans less oxygenated. Understanding how the planet worked in the past is going to help us understand where we are going in the future,” Elrick said. It was a tough road to achieve funding, but the information Elrick and her team have discovered so far is priceless information that will further benefit our knowledge of the past and future of the Earth. “I was pretty disheartened after so many attempts at getting this work funded and it felt really good to have my peers read and judge that proposal as fundable. I’m glad my colleges agree that it is a good project and it is going to be really useful for the next decade to generate a history of the oceans oxygenation; it will be used on all sorts of studies,” Elrick said. To learn more about Elrick’s research, visit her website.